That’s a misnomer if a cowboy ever said one. “Plan to spend the day” was the warning of his son. “Because, once you get there, he won’t stop until you’ve seen it all,” the warning continued. Enthusiasm glowed as the-74 year-old cowboy relished stories of every bit, spur, saddle and accompanying Western menagerie explaining almost intimately details of acquisition date, place, person, cost and follow-up research. When there are more than 3,000 bits, about 300 pairs of spurs, and nearly 50 saddles on display, that’s a big bunch of stories, lots of reflected memories. 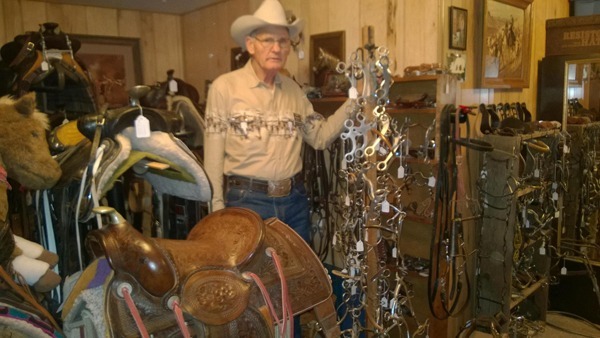 Larry Browning has a vast collection of bits, spurs and saddles at the Circle B- near Emporia. Foretold remarks as one approaches gateway to the picturesque handful of bright red buildings in the most immaculately landscaped headquarters for the Circle B-, northeast of Emporia, gives only mere inkling of actually what lies ahead. 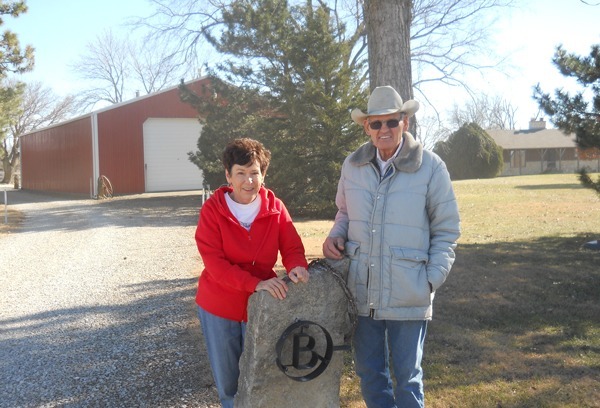 Sandy and Larry Browning are at the gateway to their immaculate, picturesque Circle B- headquarters, northeast of Emporia, featuring bits, spurs, saddles, merchandise tins and a wide menagerie of other Western memorabilia. As the car door slams – the bit, spur, saddle display room and Western equipment repair shop door opens with a welcome from the grinning cowboy himself: Larry Browning. “Come on in. I want to show you some stuff I have. It’s all here on display. I’d like to have you see it, and tell you about it all,” Browning invited. Whatever expected was surpassed as there are literally bits, spurs, saddles everywhere inside the very crowded, yet somehow very-organized 64-foot-by-40-foot red metal-sided structure. “Everything I have is on display here. I don’t have anything in boxes. So many collectors have their stuff boxed up so nobody can see it, and they don’t know where it is either. What good does that do?” Browning wondered. “I know what I have. Sometimes I might not know right where it’s at, but I’ll think where it is, and show it to you when I remember,” Browning contended. Almost every piece of “stuff” is identified with a small white tag indicating place, date and additional information of acquisition and merit. Further indexing of the impressive collections might come, but Browning insists it’d have to be with prodding and cooperation from his wife, Sandy, who has her own collection of different sorts. Her country tins, which deserve and demand further discussion, are displayed in another barnyard building. Merchandise tins and signs have been collected, are displayed and for sale in Sandy’s Country Store at the Circle B- near Emporia. “I was raised on this place, only lived away from here about four years, and we’ve been back about 46 years. We’ve built everything there is, had some contractors do part of the work, but I’ve helped and had a part in all of the construction,” Browning said. “We always had horses. I’ve ridden horses ever since I could get on one. I was always attracted to horse equipment, too. I started buying up bits, spurs, saddles about anything to do with cowboys and horses at auctions a long time ago,” Browning reflected. “Then, after I retired, I spend more time at it. My interest expanded. Studied it more. Found out what was more valuable, in demand, what I liked, and what I really wanted. I watch the auctions pretty closely and go to a lot of them – some quite a distance, and attend a number of horse sales annually, too.” Browning commented. Impossible for a lay visitor to remember and understand all of the descriptions, names and uniqueness of the collections. “I’m really into bits. There are so many kinds. If they have a name on them, they are the ones with value. One of the most important features of any collectible bit is the maker’s mark. “Not all bits are marked, and it is possible in some cases to attribute an unmarked bit to a specific maker. But, no matter what, a marked bit will be worth more than an unmarked one, even if the two are both 100 percent sure to be from the same maker,” the collector said. “To one, a bit might seem valueless, and then somebody else wants it, and the sky might be the limit on what will be paid for a bit,” Browning said. One bit could bring $1 at a sale, and another bit into the thousands, if two people wanted it. Actually calculating a worth of the collection is impossible, and Browning is unable to even put a price on many of his bits. “I have a U.S. Calvary bit that came from my grandfather; it was the first bit I got. This one could be my most prized bit, and might be the most valuable. It’s just impossible to know,” Browning insisted. There are bits everywhere in the building, attached to each other hanging in rows and rows from the ceiling to the floor, all along the walls, in dozens of a wide variety of display cases, and just laying on counters and in corners. Each one has Browning’s own collection story related to it. While there may be a few duplicates, most of the bits are unique as to mouthpiece, port, cheek pieces, headstall rings, rein rings, slobber chains, rollers, and on and on. “I have a couple of medicine bits. Did you ever see one of these?” asked Browning, while demonstrating how medicine could be poured into a funnel attached on the bit, and liquid medication would run into the mouthpiece, and on into a horse’s mouth. “Pretty neat to have that, huh?” Browning evaluated. A number of the bits were made by cowboys on forges to fit their personal need, and there are no others anywhere like them. Among a few of the notable factory brands in the collection are Bohlin, Boone, Buerman, Crockett, Estrada, Kelly, McChesney, and Shipley. Although Browning isn’t a bridle headstall collector, he has hundreds on hand, many very unique as well. “What am I supposed to do with them? They are quite valuable, too, in their own right, especially some of these century old headstalls with wide engraved cheek pieces and silver spots. So, I’ve restored them, and have many of them displayed with the bits they came on, or on ones they fit with appropriately,” Browning acknowledged. Description of the spurs, especially to a lay person, is as varied as imaginable. While there are a few single spurs, Browning is always searching for a matching spur emphasizing that spurs are a lot more valuable if there’s a pair. Spurs can also vary in value depending if two collectors want them. The first known spurs were used even before the Roman empire, and spurs have been an integral part of Equestrian culture ever since. Cowboy spurs that are well known today descent from the spurs worn by the Spanish. These spurs often featured fine filigree style heel bands and shanks, but their most distinctive feature is rowels that are sometimes as large as eight inches in diameter. Again, the spurs have varied rowels, angle, shape and length of shank, jingle bobs, heel chains, buttons, inlay engraving, heel band, and more. Homemade spurs are completely unique with only one pair like them, but they don’t often have the value of certain collectible spurs. Among his name brand spurs are Bohlin, Boone, Buerman, Crockett, Estrada, Kelly, Miller, and Roy. Of course, many spurs come with straps, and Browning, although not a spur strap collector, has a huge assortment. Again, he’ll typically oil and restore the straps whenever they come into his possession, then frequently place them back on the spurs they came on. Spurs are in no specific place among the displays, but rather throughout the entire building, spread among the bits, saddles and sometimes almost hidden in the other western collectibles. While the building’s main floor is jam packed with memorabilia, there is an upstairs area even tighter arranged with mostly bits and spurs, but also harness, hames, twitches, bootjacks, farrier tools, anything horse related Browning might have seen available and had the urge to own. Display again is of essence with such a collection. “I am always looking for ways to better display everything. I have many different display cases, and I just acquired another one with shelves in it to prominently hang several dozen bits” Browning showed. Old saddles are most valuable especially to a collector, and Browning has a number of saddles built before the turn of the past century. “Some of these were really dried out, and most people would have considered them completely worthless. I paid $25 for this saddle, and have $300 in restoration. It ought to be worth at least $325, but I really don’t know. “There are catalogs showing the value of some saddles more than a hundred years old, but the most expensive ones are all original. This one has new lining, new stirrup leathers and different stirrups, so it’s probably not as valuable. But, I showed it in the antique class at the Lyon County Fair here in Emporia and got a best-of-the-show ribbon,” Browning said. With nearly 50 saddles, there is just about every size and shape imaginable including the one used by Browning’s dad and all of his family as they were growing up, along with a pony saddle which belonged to his daughter. “I oiled and restored them both, so they’re really in good shape,” he noted. 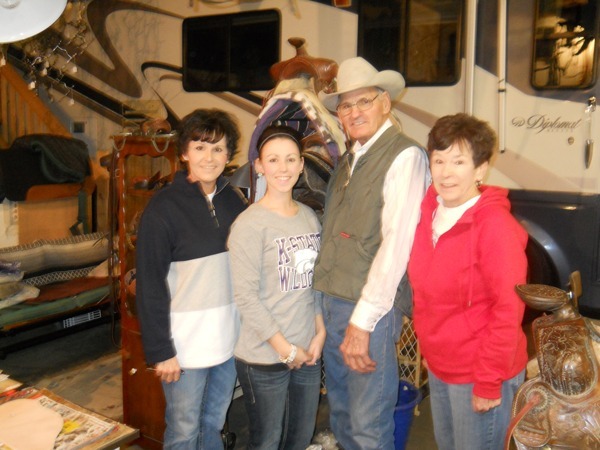 Larry and Sandy Browning, right, are with their daughter Cindy Kraft and granddaughter Chandry Nelson in the bits, spurs, saddle collection display room at the Circle B- near Emporia. There are saddles for roping, cutting, pleasure riding, trail rides, Calvary saddles, even English type saddles, a side saddle and a very heavy silver mounted Western parade saddle. Trees, horns, seats, cantles, stirrup leathers, and stirrups are quite varied. “I have a large collection of steel stirrups which were the only kind used in the early part of last century,” Browning pointed out. “Most all of these saddles are for sale, and I have saddles on display for sale at Jim’s Cowboy Shop and F & F Feeds here in Emporia,” noted Browning, who quietly admitted that saddle demand isn’t strong at this point. Again, saddle and tack repair is a key part of Browning’s interest. “I actually got started doing my own repair work, and other people asked me to do theirs, too. I have a sewing machine and can do about whatever is needed, but sometimes I have others do special sewing for me. “Instead of a real sheepskin which is quite expensive, I’ll often use artificial material for saddle linings,” Browning said. “I do custom saddle repair for cowboys around, and also work on saddles for some Western stores,” he added. Among the prominent saddle brands in his collection are Bentley, Hamley, Hereford, JC Higgins, Mueller, Newelly, Sears and Roebuck, Shepler, and Shipley. Two restored horse drawn vehicles are also stored in the building. “It’s full, that’s for sure, but I don’t think I want to construct another building. I’d just have to get more bits, spurs and saddles to fill it up,” Browning admitted. Next door is another barnyard building housing Sandy’s Country Store. “A lot of home products originally were merchandized in tins, and I got interested in them about 25 years ago,” Sandy recalled. “I started displaying the tins about five years ago. Marshmallow and peanut butter tins are my favorites. Others include potato chips, candy, peanuts, coffee, tobacco, and lard,” Sandy continued. Tin signs are also a major part of the collection. “Some are reproductions, but if I like them and they fit in with the country store atmosphere, I get them. Originals are much harder to find, and are the ones with the most value,” she noted. Special attractions in the Country Store are a tiny one-room school room complete with desks, chalk board, hand bell and a miniature school display. “I taught school for several years, so I just decided to make this part of the display,” Sandy commented. 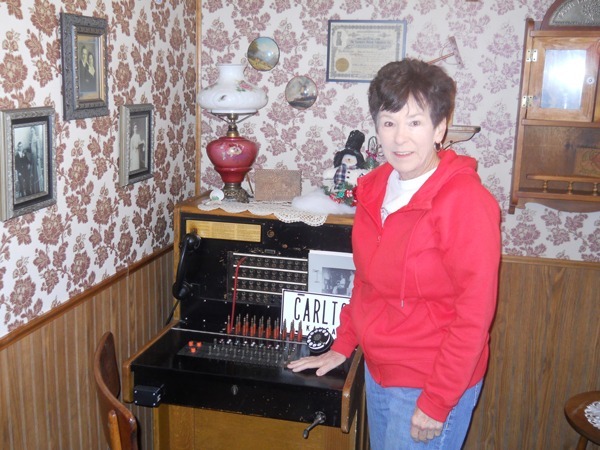 Serving as a telephone switchboard operator at her hometown community of Carlton while attending high school in Chapman where she graduated, Sandy (Martin) Browning has an antique telephone switchboard on display along with a small one room school in her Sandy’s Country Store at the Circle B- near Emporia. 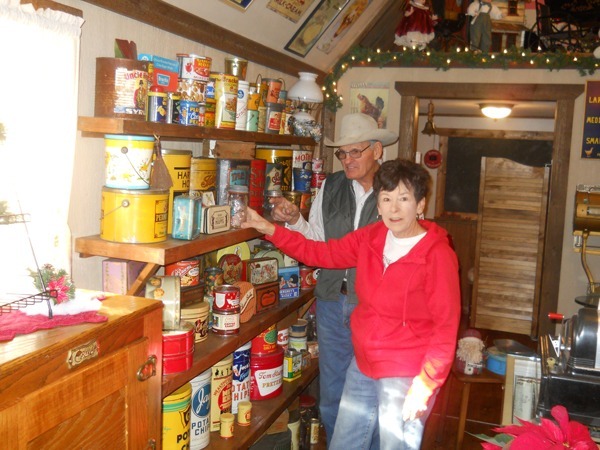 Sandy Browning hosts a Christmas Country Store Open House each year. A three-stall horse barn a few yards away sets idle of its original purpose. “Our daughter, Cindy, and son, Lee, showed horses while they were growing up in 4-H. We haven’t used this barn much for horses since then,” Browning said. One room there is filled with collectibles, too, including the saddles Browning used on the pair of Longhorn steers he had broke to ride and rode with a friend in a number of area parades several years ago. “Oreo is deceased and I have his head mounted in the shed, but Milk Dud is out in the pasture,” Browning said. “I used to have to oil these saddles about once a year, but with a de-humidifier in this room, it’s only necessary every four years or so,” Browning noted. At the opposite end of the farm is another large barn semblance of other structures, but this one is for a tractor, equipment, and hay storage. “We started in the Longhorn business after Cindy got a Longhorn cow when she was the Kansas Longhorn Queen in l985. We had up to 15 registered Longhorn cows at one time, bred them artificially and sold seed stock for a time,” Browning said. “We have cut back to the remaining four Longhorn cows with three calves and the big near ton Longhorn steer,” he added. 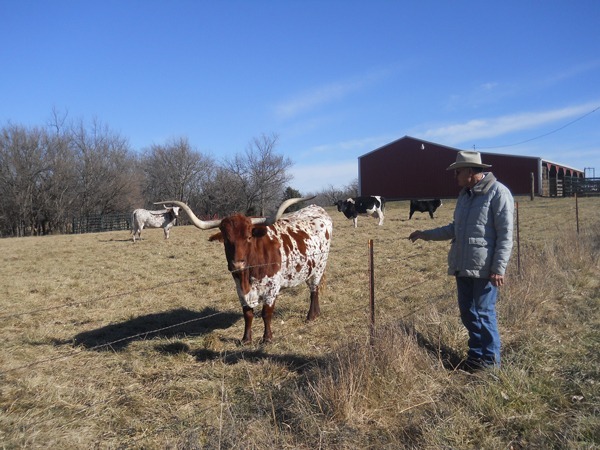 Larry and Sandy Browning and their family at the Circle B- near Emporia have raised registered Longhorn seed stock for a number of years collecting awards at several competitions. In the big steer’s pasture also are three horses. “I used to break horses to ride, and when I was working, I’d saddle a horse every day and ride when I’d get home. I could ride these horses, if I wanted to. That sorrel is even broke to drive. But, I haven’t ridden for a long time.” Browning said. “We built our home in l978, and continued to add onto the acreage and now own most of the original family acreage,” calculated Browning, noting that land improvement projects including timber harvest for firewood have always been ongoing. Both Larry and Sandy have been actively involved in 4-H for the past 40 plus years, serving as club and project leaders. Cindy and Lee were both members for 12 years showing horses, sheep, and swine. 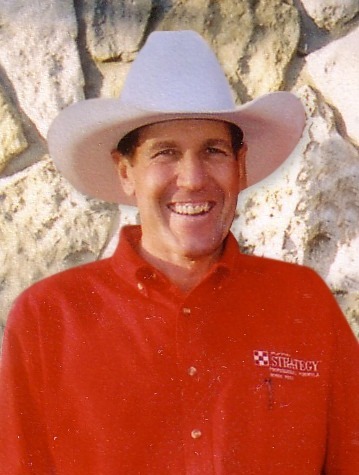 Larry currently assists with all horse shows and rodeos for the Rawhide Wranglers 4-H Horse Club. 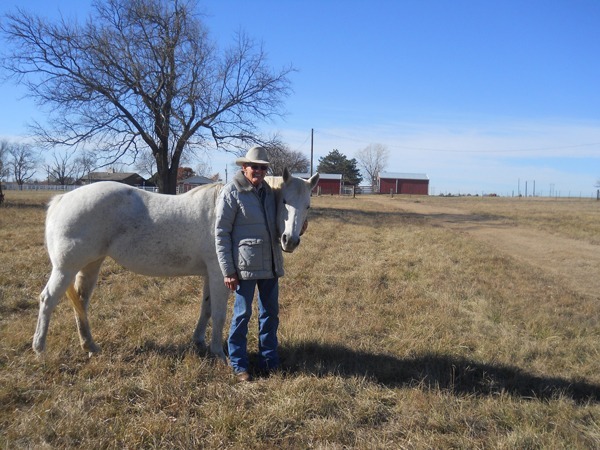 Horses have been at the Browning family home place northeast of Emporia for more than seven decades and continue to graze pastures behind the Circle B- headquarters. Lee (co-owner of Bill’s Diner and B&B Backyard) and his wife, Janell, live in Topeka with their three sons, Lane, Wyatt, and Reid. Cindy, a teacher, and her husband, Mike Kraft, live just north of the Brownings. They have a daughter Chandry, and a son, Heath. Chandry was actively involved in the Quarter Horse Association and showed for seven years. Browning has been retired from Kansas Power & Light for 13 years and Sandy from Emporia State, seven years. “I don’t have much stuff, but someday I’m gonna.” Larry Browning repeated.